Your stay at Avonview Manor B&B includes non-alcoholic refreshments upon arrival and a full breakfast featuring home-made preserves, mouth-watering breads and pastries, and locally-grown produce and meats featuring high quality goods from the Mennonite community of St. Jacob's, as part of your hot gourmet entre. 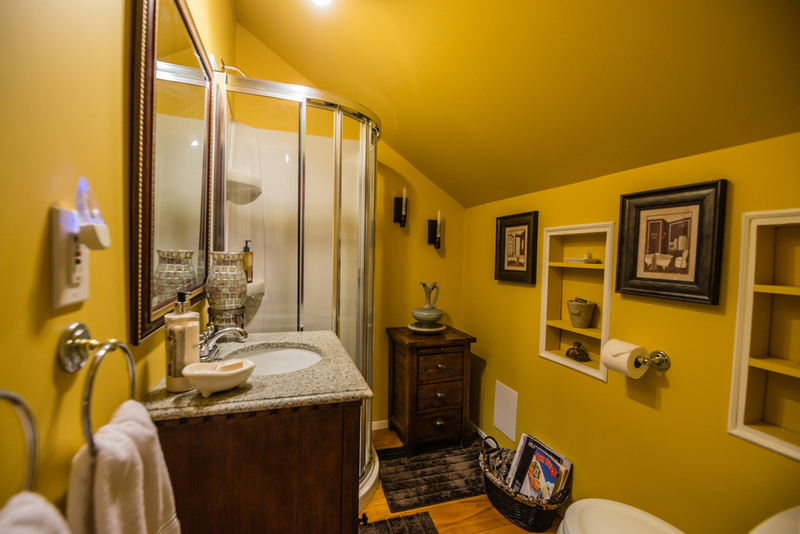 Suites have a choice of ensuite, private or shared bathrooms. Named after the great leader, "Winston Churchill"; this suite has the true feel of an English Gentleman's coach quarters, with shared or private three piece bath dependent on occupancy. Ideal relaxation, after a day of strolling, shopping, or cycling. This sunny nook named after our host's cousin "Robert Louis Stevenson", is fit for the most prolific writer, and is reminiscent of Edinburgh in the mid 1700s. Relax in the large common room with an apres theatre night-cap and a good game of chess by the fireside, or enjoy a rousing game of foosball on a rainy day. There is also a host of CDs/DVDs, great books, puzzles and board games to pass the time. The Ol' Winnie and Robert Louis Suites are located in the third floor Attic Loft which can be booked as an entire suite - ideal for families, a foursome of friends, or two couples traveling together, OR the suites may be booked independently. These two Queen bedrooms share a three piece bathroom and a large common area/games room with kitchenette, gas fireplace, big screen TV, record player, and foosball. A romantic get-away, 'somewhere' in the south of France. Bask in the morning sun through the Edwardian leaded windows, as you awaken to the aroma of freshly ground morning coffee, or steeped breakfast tea. This suite is a special dedication to our former beloved country, retreat and lake-side home in Northumberland County. Aye Lighthouse had a unique story, character and charm. Our goal is to remember it fondly with this nautical-themed suite, reminiscent of a lighthouse keepers' cottage in the 1800s. The suite offers a private 3 piece bathroom, and interior porch with views to the lovely garden, parkland and the Avon River. Our guests may choose to configure the suite as a single King bed, or two twins. Discounted Rates for Extended Stays in any suite. Applicable on 4 nights plus.